This was popular when I first started to grow pelargoniums seriously. 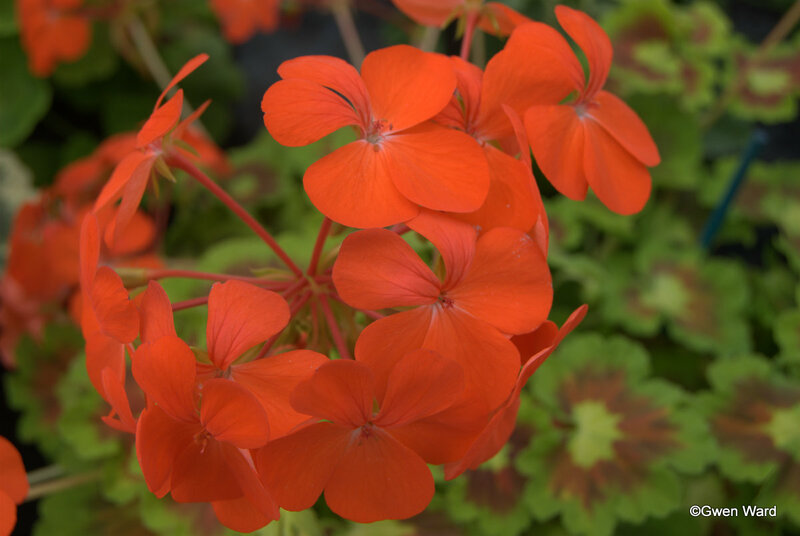 "Turkish Delight" has single flowers of bright orange/red . These contrast well against the gold centred leaves with bright green edge and wide bronze zone. It is a dwarf and compact growing pelargonium. "Turkish Delight" was raised by Ian Gillam in Canada and introduced there in 1984. The weather here has become rather cold here this last week and I think is set to stay for a few more days yet. I have had the heaters on in the greenhouses overnight, and also covering the plants with fleece. I usually take the fleece off every morning, but today I even left it on all day, it has been so cold out. 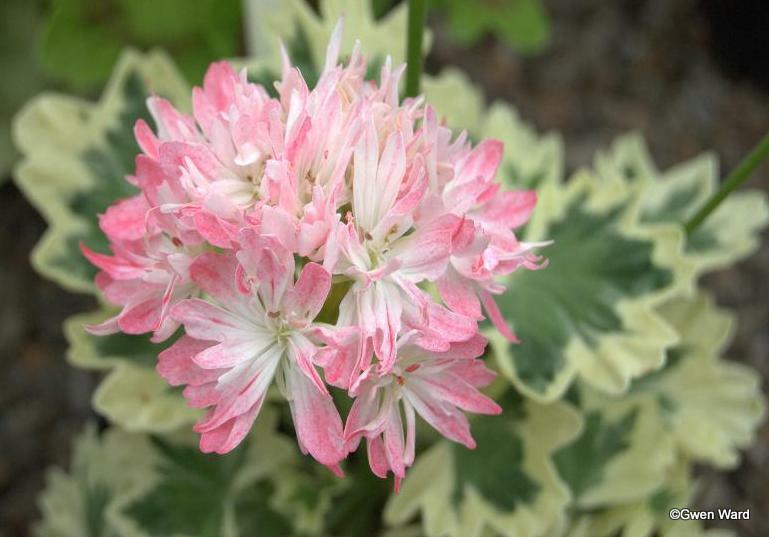 The Miniature stellar pelargonium "Brian West" is, sadly, not now readily available. The flowers are fully double, and a beautiful shade of pink with white centre. The leaves are bright green edged in clear cream. Raised by Andrew Simmons, I’m not sure when it was introduced, but it is in Sulman’s 2009 catalogue. This has gone onto my Wish List. I had it several years ago and cannot think why I did not replace it sooner. I am hoping Fibrex Nursery has it still. Here is the South East of the UK we have fared far far better than our friends in the north of the country and Scotland. However, it is not great here. We have had a lot of rain, and the weather has definitely turned very much colder, although no frosts. It is just so soggy and muddy and wet underfoot. Certainly not gardening weather. I hope the weather improves soon. I am itching to get on with sorting out the greenhouses and plants. One spark of brightness, I noticed that the coloured leaf pelargoniums are beginning to colour-up – oh! I do love the coloured leaf pelargoniums in Spring and Autumn when the lower light levels suit them so.